For much of his adult life, Maintenance Stores Clerk Ben Moore moved around, didn’t have much and worked to survive. When his marriage split up and his children moved in with their mother, Ben looked toward his lifelong passion of drawing to help cope with his struggles. Through this art, Ben found himself. And although he’s still learning and defining his style, he found expression that matters to him. 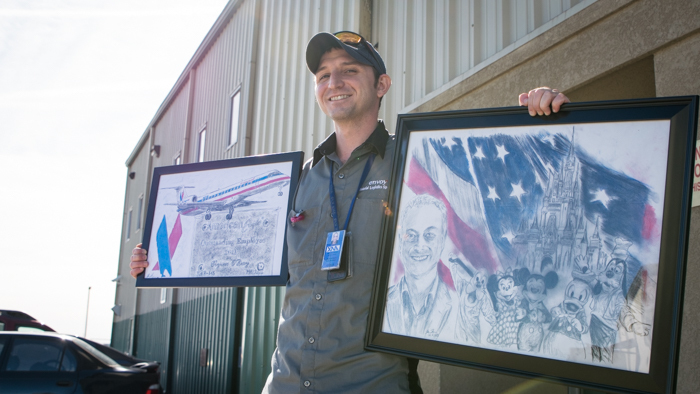 Compounded with the recent uptick in portrait requests and commissions – he recently sketched a portrait of Gary Sinise for the Snowball Express – Ben says the encouragement to draw more has “gone a long way” toward inspiring him to take his craft seriously. A self-taught artist and photography enthusiast, Ben has spent his whole life drawing, if only for his own enjoyment. He grew up reading fantasy novels like “Lord of the Rings” and playing endless games of “Dungeons & Dragons,” which is where his photo-realistic, high-contrast style gained inspiration. However, Ben never saw his art as a practical way to earn a living. Working odd jobs like door-to-door magazine sales or selling cigarettes at the local gas station, he only saw work as a means to an end. 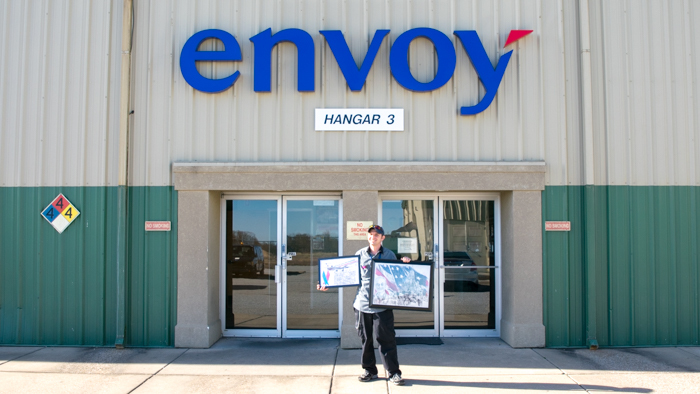 One day, while mopping floors at the gas station, Ben greeted some mechanics from the Envoy hangar at Northwest Arkansas Regional Airport (XNA) who came in to purchase some smokes. After a bit of small talk, they explained to Ben how working for an airline includes the privilege of free travel. It turned out that the XNA hangar was hiring a janitor, and Ben applied. He figured that the pay was better than his job at the gas station, and he would get to fly for free. “I decided to upgrade my situation and join Envoy,” he said. 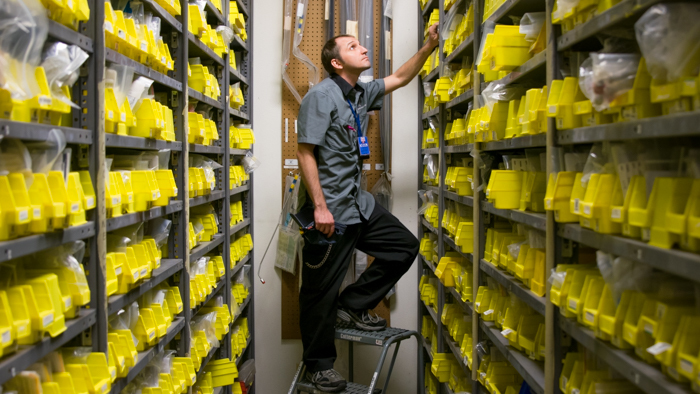 Ben has been with Envoy for 12 years, starting out as a janitor for the entire maintenance facility and now, working in the tools and parts storeroom as a stores clerk. Ben said that his foot-in-the-door to becoming a stores clerk was taking a chance on the janitor job, which had opened so many opportunities for him. 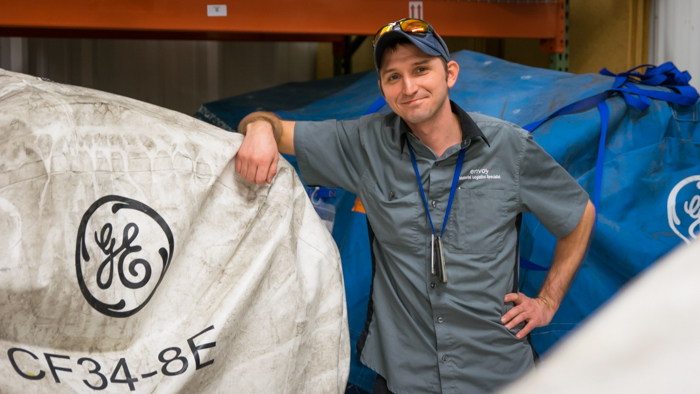 As a stores clerk, Ben supports the mechanics and technicians that maintain Envoy’s aircraft by keeping inventory, locating and gathering orders of tools and parts. The same keen attention to detail and time management skills used to create his artwork perfectly complement his daily duties at the XNA hangar. Just like he had planned, Ben has taken full advantage of Envoy’s travel privileges that allow employees to fly anywhere American Airlines flies. For Ben, advancing his career meant realizing that he, in fact, could earn a bit from his artwork. Through word of mouth and promoting his artwork on his Facebook page, Ben has worked up a steady stream of commissions for portraits. People are drawn to his ability to sketch life into his portraits, which Ben said is a matter of choosing the right photo to reproduce. He prefers to capture the person, or pet in many instances, in action, “doing what they’re doing,” he said. Through all of his newfound success and ambition, Ben remains humble. He knows that he must continue to hone his craft and market himself as an artist, if he wants to continue to grow. But things are looking up for Ben – he now has custody of both his children, with his teenage son interested in becoming an airline pilot. Regardless of his transforming life, Ben no longer has to work to survive. All of his wandering has paid off, and he’s finally home.